Alinco has created a new 2 meter HT that sets new standards in features, convenience and easy operation. The DJ-175 sports an alphanumeric display for easy memory management. It has an ergonomic design thatâsâuser friendlyâand the 5-watt output battery is standard. Be prepared for virtually any selective calling situation or gaining access to repeaters with 39-tone CTCSS, 104 DCS, Tone-bursts and DTMF encoding, all included at No extra costs. Best of all, DJ-175 retains the proud Alinco tradition of quality construction and excellent value. 7.2V Battery only / External DC port is NOT available. Narrow-FM models avaiable depending on areas of distribution. 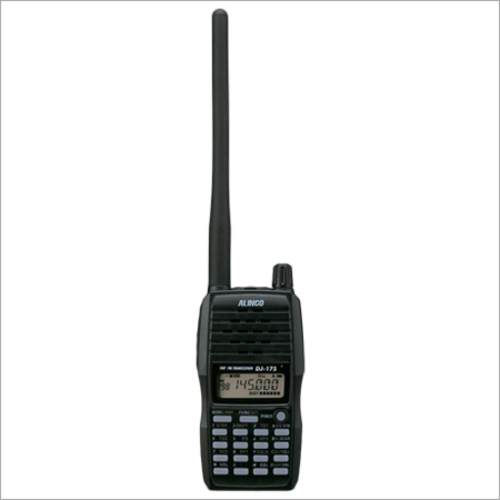 GVTEL Communication Systems specializes in supplying Alinco Walkie Talkie systems. These are integrated with varied and extensive features which enhances their demand in the market making them a hot seller. Our efficient team and quality experts supply a plethora of these sets on a large scale. These handheld communication systems are designed and manufactured under strict guidelines provided by our proficient auditors using the supreme quality of raw materials. These Wireless Walkie Talkies are compact in size, user-friendly and are light-in-weight. Alinco Wireless Walkie Talkie systems are manufactured with state-of-the-art technology and high grade premium raw material as per the industrial norms. Moreover, our products are available at competitive prices.